There's very little plot but plenty of entertaining punch-ups in this tough revenge western. 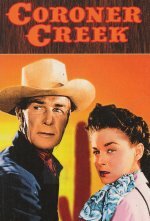 Based on the novel by Luke Short, it sees no-nonsense gunman Randolph Scott out to get even following the death of his fiancée during a stagecoach raid. He's so driven by hatred that all he seems to do is fight, turning the titular small town into a battle zone as he works his way towards George Macready's icy villain. In between the fisticuffs, the script is rudimentary and the direction pedestrian, leaving it down to the handsome vistas and richly saturated Cinecolor visuals to hold the attention.